What is Communications? – ¿¡ tjongolongo ?! Last week I let you know my view on what Marketing is, this week I’ll tell you what I think Communications is. A lot of people make the mistake of thinking that Marketing and Communications are one and the same, however this is not true. A process of transferring information from one entity to another. The Wiki statement is true, but when it comes to businesses to me it’s more than just transferring information. In my opinion, the transferring of information has a goal, namely, reputation management. What I mean with that, is that it’s not good enough just to use your standard communication tools when working in the field of communications. You also have to make sure your company communicates your message through and through, this can be done by office decor, a corporate dress code, the way you treat your clients, the look and feel of company cars etc. Communications encompasses everything that communicates whether it’s what you say to other people about your brand or what you let them they see. In this case a brand can be anything, a person, a company, a product, etc. Influencing plays a big part in Communications, because once you are able to influence your internal and external target groups the way you want you have reached effective communications. You will hopefully have created people that will speak about your brand to others in a positive way and in turn influence others. To me, that’s what the end result of effective communications is all about, influencing people to say what you want them to say. You want them to get the message and pass it on. 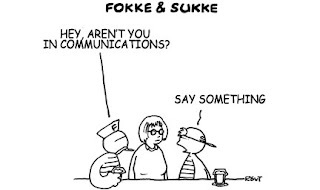 What is your definition of Communications?